What Does Harrison Ford Think of the Han Solo Movie? It is Star Wars Celebration time and that means there is going to be a whole lot of news and surprises coming throughout the weekend, all relating to a galaxy far, far away. This morning, the event kicked off with a panel celebrating the 40th anniversary of Star Wars and as a nice surprise for fans, Harrison Ford showed up. Just after the panel, he did a brief interview and was asked about his feelings on the upcoming Han Solo movie. He seems somewhat optimistic, but admits that it will be weird. Just after the 40 Years of Star Wars panel wrapped up at Star Wars Celebration, both George Lucas and Harrison Ford were brought up to the Celebration stage for a brief interview and chat about the panel and some broader Star Wars questions. Harrison Ford was asked if he is looking forward to watching the Han Solo movie as a fan, since he won't be in it. Here is what he had to say. "Not really...(laughs) No, I'll be watching it as a...as a...No...Of course I'll be watching it as a fan. But it will be weird. It will be a little weird. But I've met the fellow who is going to play the younger Han Solo, wonderful guy, very sweet, and a very good actor. I'm delighted in the choice." The fellow in question that Harrison Ford mentions is Hail Ceasar! star Alden Ehrenreich, who has been tasked with playing the legendary smuggler. 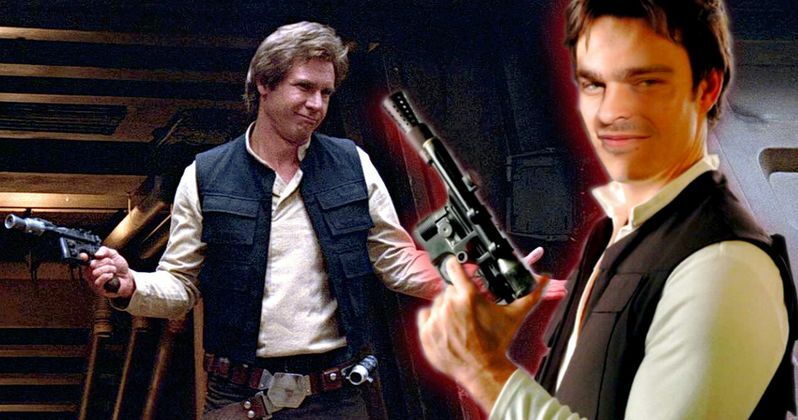 It was officially announced during last year's Star Wars Celebration that he would be stepping in to play Han Solo in the upcoming Star Wars spin-off, but at that point, it was one of the worst kept secrets in Hollywood and wasn't much of an announcement. It likely means a lot to Star Wars fans, and to Alden Ehrenreich, to get Harrison Ford's public approval like this. The character was first brought to life by Harrison Ford brilliantly in Star Wars: A New Hope four decades ago and it will be very tough for anyone to be able to live up to that legacy, but at least the actor doing it has the important seal of approval. The timeline for this young Han Solo movie will be roughly ten years before the events of Star Wars: A New Hope. Specific story details are being kept under wraps, but it has been said that we will be learning how the character "got his name," which was how Disney CEO Bob Iger put it. That could either mean that Han Solo isn't literally the characters, or it could mean we are going to learn how he earned his name, more in the reputational sense. Not literally his name. In either case, that makes Alden Ehrenreich's burden even greater. We'll have to see what Harrison Ford thinks after he sees the movie next year. Han Solo: A Star Wars Story also stars Alden Ehrenreich, Donald Glover, Emilia Clarke, Thandie Newton, Michael K. Williams, Phoebe Waller-Bridge, Ian Kenny and Woody Harrelson. The movie is being directed by Phil Lord and Chris Miller with a script from Jon Kasdan and Lawrence Kasdan. The young Han Solo movie is set for release on May 25, 2018. You can check out the interview clip with Harrison Ford from Star Wars Celebration for yourself below.